In the coming weeks, kindergarten registration in most public, non-public, private and parochial schools will occur. In addition to knowing which school your child will attend and filling out that school’s registration information, it’s important to make sure your child is up to date on required immunizations for attendance at school. According to the Pennsylvania (PA) Code (a listing of all rules and regulations in the Commonwealth of Pennsylvania), all children attending school for the first time must have required immunizations completed prior to the first five days of school. After that, if your child doesn’t have proof of immunization (or proof of starting a series of immunizations), your child will be excluded from school. This code applies to children entering all school types listed above – public, non-public, private and parochial schools – as well as cyber, charter, home school, vocational, intermediate units and special education programs. Whether you take your child to a pediatrician, a family medicine physician, or an advanced practice clinician in either field (such as a certified registered nurse practitioner or a physician assistant), start with a call to their office. You will need to have a medical and immunization form completed by your child’s primary care provider which is turned in with your child’s kindergarten registration information. Advance planning with MyLVHN: If your child sees a provider from Lehigh Valley Physician Group (LVPG), you can request proxy (guest) access to your child’s MyLVHN account at your son’s or daughter’s next appointment. With MyLVHN, you can see the immunizations your child has received and will know if he or she needs any updates. Diphtheria, tetanus and acellular pertussis – Four doses, including one dose on or after your child’s fourth birthday. Polio (poliomyelitis) – Four doses of either oral polio vaccine or inactivated polio vaccine. Measles (rubeola), mumps and rubella (German measles) – Two properly-spaced doses of live attenuated MMR combination vaccine or evidence of immunity. Hepatitis B – Three doses hepatitis B vaccine. Varicella (chickenpox) – Two doses or evidence of immunity. You can also refer to School Vaccination Requirements for Attendance in Pennsylvania Schools for this list. Help – I need a doctor for my child! Call 888-402-LVHN (5846). You will receive assistance from one of our helpful call center representatives to identify a doctor or advanced practice clinician who can care for your child. 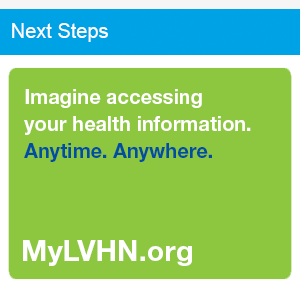 Visit LVHN.org. On green overlay press Schedule Now, then select either Family Medicine or Pediatrics. Choose an appointment from list. Visit LVHN.org/findadoc. Search for pediatricians or family practice physicians by selecting Primary Care from the list under Type of Care. On most provider’s Find a Doctor page, you can schedule an appointment. Get to know our providers by watching their videos and reading reviews from patients (for providers who have at least 30 completed patient satisfaction surveys). * If needed, schedule catch-up immunizations with your child’s primary care provider. * Make copies of completed forms so you have current information on-hand and can refer to when needed for other activities, such as scouts, sports, etc. If you need a primary care provider for your child, turn to LVHN for help at 888-402-LVHN (5846) or LVHN.org to Schedule Now or to Find a Doctor.